Our next meeting will be on Monday, October 27, 2014 at 6:30pm at the Rapides Westside Library in Alexandria. The public is welcome, so bring a guest if you can. For this meeting, we'll watch the video of Lefty Kreh on fly casting that we had to postpone from earlier this summer. Lefty is the dean of fly fishers... his video contains numerous tips to help improve your casting. Following the video, we'll have open discussion of casting topics. Also on the agenda: fishing reports, update on the Cenla Fly Fishing Festival, other upcoming events including Rendezvous, and updates on proposed club trips. Note: our November 24th meeting will feature LDWF regional biologist Rickey Moses who will talk about area fisheries, including results of their current surveys. Make plans now to attend this one! What is Rendezvous? Twenty-six years ago, a group of fly fishermen from Texas, Louisiana, Arkansas, and elsewhere decided to get together for a weekend to fish and tie flies. They found the facilities at North Toledo Bend State Park to be ideal. Since then, the tradition has continued and grown. There's no planned activities, but plenty of fly tying, food, fly casting and fishing, with only a minimal fee to cover lodging and meals. The activities take place at the park's group facility, which features a commercial kitchen and dining hall, and lodging available for up to 150 people in 5 heated log bunkhouses (30 beds each). There's also a heated central shower and restroom building with nice night lighting on all the sidewalks and a large main log building with A/C, picnic tables and a large barbeque trailer. Held the first weekend of November each year, the Toledo Bend Rendezvous (aka Southern Fly Fishers Rendezvous) is co-sponsored by the IFFF Texas and Gulf Coast Councils. It remains one of the top fly tying events in the country, with many of the attendees featured at regional and national expos. Our next fly tying session will take place on Monday, October 20, at the Rapides Westside Library in Alexandria. Time is 6:30pm. The public is invited. 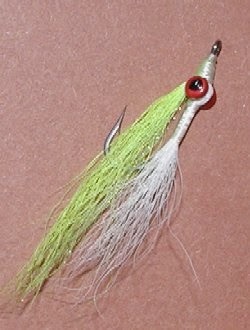 The pattern this month will be the Clouser Minnow. Developed by Bob Clouser for smallmouth bass, it may be the most universal pattern ever created. Lefty Kreh claims to have caught 87 different species on this fly, and our response is "That's all?". Here in Louisiana, Clousers are the best fly for speckled trout, sand trout, and white bass, and a good fly for redfish. It's also a great pattern for schooling largemouth. It's also fairly easy to tie. Bring your tools if you have some, materials will be provided. For those without tools, the club has 3 sets of tools for use only during tying sessions. See ya there! This is limited-seating workshop for tyers, with some experience, throughout the region. Cost is $20 per person and includes: tying supplies, beverages, breakfast snacks and lunch. Bring your tying equipment. Reservations are based on 1st come 1st serve.